1. 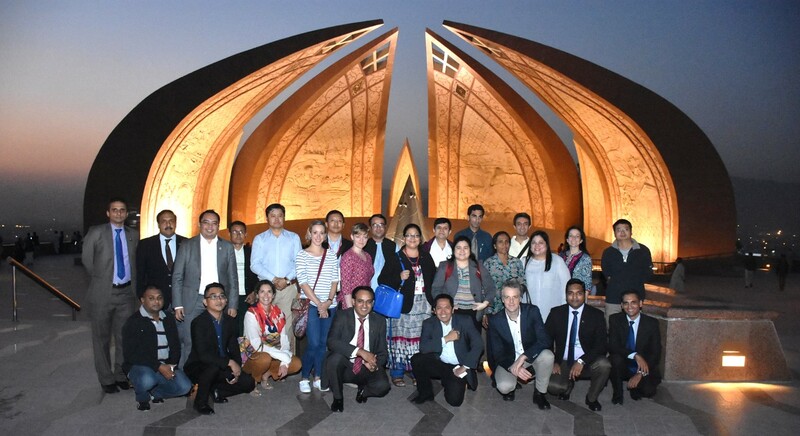 National agencies and authorities entrusted with disaster management in Asian countries established the Regional Consultative Committee (RCC) on Disaster Management in 2000, as an avenue for regional dialogue to exchange experiences and promote peer advocacy. With the support of the Asian Disaster Preparedness Center (ADPC) as its Secretariat, RCC serves as a common platform to promote regional cooperation towards achieving common DRR goals. The committee has been meeting on an annual basis for the last twelve years to deliberate on themes of interest encompassing disaster risk reduction and climate change adaptation in the broader context of development strategies. And thus the RCC is, at present, well positioned to render advice and support on disaster and climate risk management to its member countries. 2. In the 13th RCC Meeting entitled “Operationalizing Global Frameworks for Risk-Resilient Development in Asia”, held in Islamabad, Pakistan from 17 – 19 October 2016, we the delegates of Afghanistan, Bhutan, China, Indonesia, Maldives, Mongolia, Myanmar, Nepal, Pakistan, Philippines, Sri Lanka, Thailand, and Vietnam, along with development partners, and participants from sub-regional organizations, rea_rm that the value of the RCC lies in its capacity to present technical solutions, and to facilitate regional cooperation among member countries in the implementation of their national, regional and global commitments on gender-sensitive DRR and climate change adaptation in the broader context of sustainable development with focus on vulnerable groups. b. The importance of the Sendai Framework for Disaster Risk Reduction indicators, which will imminently be adopted, to be further operationalized in order for them to add value to, and to be more applicable in accordance to the specific environment of a country to which they are applied. c. The necessity to optimize, or as appropriate, to expand the role of respective national disaster management agencies in providing guidance and, to the extent possible, in monitoring the parallel planning and implementation of the climate change framework at national and local level need due consideration. d. The partnership between disaster management agencies and authorities with non-governmental organizations and civil society organizations need to be further improved and institutionalized. Similarly, the formidable potential of the private sector remains to be optimally mobilized. e. Possibility of complementarity exists among various regional forums in the specific domain of disaster risk management, climate change and sustainable development goals. f. The need for disaster management agencies and authorities to leverage development planning and its implementation across sectors, and likewise for development partners to enhance the coherence in their approaches, in order to synergize the varying requirements of the different global frameworks at the national level in a cost-effective manner. b. Recommend to member countries to leverage RCC as one of regional mechanisms to identify tangible entry points for implementing such global frameworks in accordance to their respective DRR policies and programs. 5. Acknowledge the need for further consultation of the Asia Regional Action Plan, which is imminently to be adopted by the Asian Ministerial Conference on DRR, towards its effective implementation including through national contextualization and appropriate progress monitoring and reporting mechanism. 6. Recognize that in the context of regional complementarity there is the need for furthering the synergy between the RCC and sub-regional groupings related to disaster and climate risk management including APEC, ASEAN, SAARC, ECO, and Istanbul initiative - Heart of Asia (Disaster Management Confidence Building Measure). 7. Request Pakistan to share, as a contribution by RCC countries, the key outputs of this 13th Meeting of the RCC to the Asian Ministerial Conference on Disaster Risk Reduction in 2016. 8. Reiterate to establish sustained linkages and policy-interfacing with United Nations relevant mechanisms including and not limited to ESCAP Committee on Disaster Risk Reduction as well as the Global Platform for Disaster Risk Reduction. 9. Encourage RCC member countries, to the possible extent, to initiate, facilitate or champion the implementation of the activities recommended in the Islamabad Statement and, in this regard, appreciate Indonesia offering to RCC member countries the Disaster Relief Training Ground’s regional capacity development programme, which is developed in collaboration with ADPC. e. Facilitate the implementation of the recommendations set out in this Statement, and report progress in the subsequent Meeting. 11. Expressed appreciation to the excellent arrangements and leadership extended by Pakistan as the host of this 13th RCC Meeting.